Stories travel as far as Antarctica and curiosity burrows deep for the founder of The Moth George Dawes Green. This is the sixth installment in a new series called Keepers of Curiosity, featuring interviews with intrepid performers, artists, writers and culinary-minded individuals with a thirst for discovery and innovation. The series is brought to you by Hendrick's Gin. To read the other interviews in this series, click here. I write novels, highly emotional thrillers, like The Caveman’s Valentine, The Juror, and Ravens. I like to put ordinary people into impossibly cruel circumstances and see how they hold up. I’m also the founder of The Moth, an organization for storytelling. We tell personal, unscripted stories, the kind of stories that people usually tell in kitchens, but at The Moth we bring these stories onstage and make a fuss over them. The stage is terrifying for most folks—an impossibly cruel circumstance—but most folks hold up quite well. We’re now holding regular Moths in a couple of dozen cities across the U.S., with offshoots all over the world, including Antarctica. How would you describe your work? I tend to bite off more than I can chew. All the time, I’m sorry to say. My curiosity has always been a plague to me, that constant chirping voice in my ear. “Who invented breadsticks?” “What happened to the actor who played Wally Cleaver on Leave It to Beaver?” “What’s the definition of the word ‘so’?” It seems utterly mindless, my curiosity. It has no sense of priority, balance, or usefulness. It bears down on me always, about everything. It bids me to interrupt my reading of Being and Time to check Yankees box scores. Why? I can’t tell you. I just feel a hankering to know things. Some datum—say Brett Gardner’s batting average—is out there floating in the universe, and my brain wants to possess it somehow, to engulf it. But it’s all junk food. Out of every thousand facts I gather, I find one or two illuminating. The rest is a tide of nonsense. Well, as I say, everything. Lately I’ve been reading about woodchucks, or groundhogs, because a woodchuck has been appearing on my lawn every day. I’ve learned that these animals have bathrooms—separate chambers in their burrows for defecation—and that the name of their sleeping chamber is the hibernaculum. That’s a beautiful word, and of course I wish I were in a hibernaculum right now, but I know it will not stick in my brain. Ask me in a year the name of the woodchuck’s sleeping chamber, and I’ll stare at you like you’re nuts. None. That’s what I’m trying to tell you. Listen to me: The idea that my curiosity could ever be satisfied is insane. I know that voice. I’ve been living with it all my life. It eats all the trivial data I give it and demands more. It doesn’t even wait for one answer before it demands the next. It needs me to find out how the ballplayer Melky Cabrera is related to the ballplayer Miguel Cabrera. Dutifully I look this up, and find they’re not related at all. Then it wants to know, “What’s the derivation of Cabrera, anyway? Goatherd or something?” I say, “How could that possibly matter to me? Please leave me alone.” But it insists, “Find out!” It keeps pestering. “Find out! Find out!” And since this voice lives inside my own ear, it’s hard to ignore. Wait. Do you really imagine that I want that voice in my head? Good Lord. I only want to throttle it. I do whatever I can to distract myself. I go to loud movies, I drink bourbon, I sing at the top of my lungs while driving. Nothing helps. The voice returns. 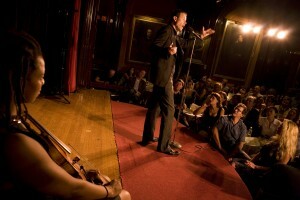 At The Moth, we’ve been developing a new project: High School Slams. We’re bringing competitive storytelling to high schools around the country, and the stories we’re finding are moving and tender and brilliant. You’ll soon hear them on our radio show, The Moth Radio Hour. And I’m writing a new novel, which, because it isn’t a thriller at all, truly terrifies its author. Also I’ve been looking for an opening to the woodchuck’s burrow. My research tells me there are many of these openings, but they’re all hidden in the briars, and anyway, they’re too small for me, so I’ll probably never find that blessed hibernaculum. Click here to learn more about George Dawes Green and to follow The Moth.